Americans Abroad is a 4-week summer workshop offered by the Department of Global and Intercultural Studies. 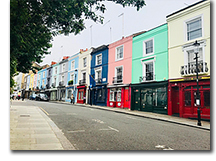 Associate professor Sande Garner and visiting assistant professor Allison Wanger, both of the American Studies (AMS) program, lead Miami students to Ireland, England, and France to examine American heritage tourism from a critical perspective. "Teaching this summer workshop is one of the highlights of our year," said Garner. "It is a great opportunity for students to see the world and reflect on their experiences as American tourists. In the process, they learn about the role that heritage and culture play in a multitude of tourist industries throughout Europe!" 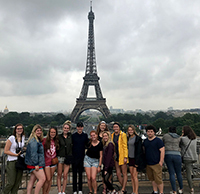 Students can get a head start on an American Studies thematic sequence or minor by taking this 6-credit hour AMS course, as they travel to cities like Dublin, London, and Paris. To get a better idea of the student experience, check out the following posts from student travel blogs for Americans Abroad from May 20 - June 16, 2018. Psychology major Maddie Filipkowski introduces her journal with a picture from the EPIC Museum (Dublin, Ireland) that frames the idea of Heritage Tourism. She provides a rundown of her favorite — and least favorite — moments of Americans Abroad 2018 to examine her expectations, experiences and the historical significance of some of the key sites visited. "As an individual, a student, and a tourist, I learned a lot about myself and the world outside of the US," she says. "These past few weeks have really set the bar for my future vacations and changed the way I look at other cultures and the way I take in these new experiences." Cassidy Hemm, a junior strategic communications and public health double major, discusses the way that her encounters with locals, tour guides and other tourists shaped her study abroad experience. 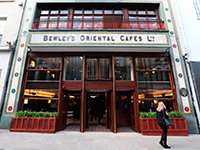 Hemm was approached by Miami alumna Marybeth Bond at Bewley's in Dublin, Ireland. "Sitting back to listen to stories and sharing a meal with an American couple shaped my view on tourism in Dublin just by hearing their suggestions on where to visit," she says. "I loved getting to be a little piece of Miami and give them information about a campus they hadn't visited in over 30 years." "I have learned to be opened minded and push myself out of my comfort zone," Hemm continues. "Americans Abroad gave me perspective on how other people travel and who they travel with and taught me to explain what the tourism culture that I was studying in our American Studies classes." In her blog, junior speech pathology & audiology major Emily Mann emphasizes the importance of tour guides and how they shaped her experience in Americans Abroad. "I found that the tour guides had such a positive impact on my ability to really push myself to view everything through their lens, rather than what I have been previously been taught about a place," Mann says. Visit Study Abroad: Tour Guides and Tourist Gaze. Junior marketing major Danielle Nehring's blog examines the value of stories and museums in her travels. She writes, "People who both lived in the cities I was in and travelers just like me. Each new meeting came with a tale just as each place held a unique culture, filled with thousands of years of stories." "My absolute favorite place in London: the National Gallery," she continues. 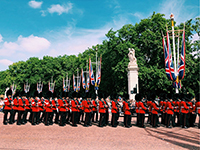 "Overlooking Trafalgar Square, this is the perfect place to meet up, grab a quick bite to eat at the cafe, and listen to the street musicians as the street artists create stunning black and white portraits, displays of flags, or roaring lions. Being centrally located to all the theatres, Regent Street, and several small cafes, it quickly becomes the center of my wanderings." Visit Danielle Nicole Photography: Americans Abroad. For more information about how you can be part of this experience in summer 2019, contact Sande Garner (garners2@MiamiOH.edu) or Allison Wanger (wangeral@MiamiOH.edu). You can also check out the Americans Abroad Instagram site.